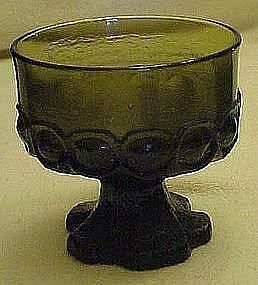 These are the Madeira footed glasses, in sherbert size that were made to go with the Franciscan dishes. These may have been made by Tiffin. This is the dark olive green color. Would work with any mediterranean style decor. These are 3 3/4" tall, nice heavy glassware and all are in perfect condition. I have 3 available. Price is for each. Please let me know quanity when ordering. Other Madeira colors and sizes, see my catalog. They will be heavy to ship, please include zip code when inquiring.